Mastering the Sales Conversation can be tricky and often a daunting task that most entrepreneurs need to practice in order to be successful. Ryann Dowdy, of Uncensored Consulting, is a sales coach and revenue mentor for women entrepreneurs. 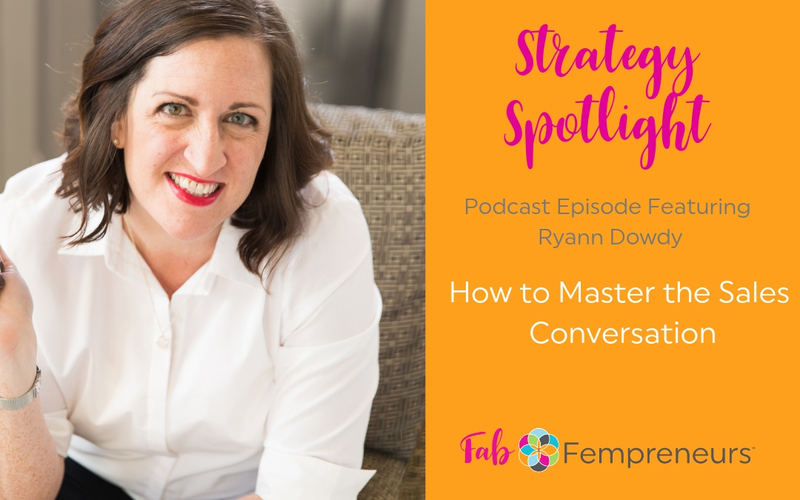 There is so much negativity around sales and in this episode, Ryann discusses how to break the barrier of the “I’m bad at sales” mindset and to shift the narrative to be more confident in your sales goals. “If we really want to grow healthy businesses and get over that negative mindset we need to learn how to sell in a way that works well for us,” she says. In this episode we learn 4 ways to Master the Sales Conversation. 1. STOP saying you hate it, aren’t good at it, or that it isn’t your thing. The more you think or say those things the more true it will become. 2. Remind yourself that selling is helping! You are helping educate your potential clients and helping them make a decision about how they want to solve their problems! 3. A sales script doesn’t have to be robotic or stiff! You should have a written road map you follow on every single sales call you run! The benefit is twofold – 1 – You don’t forget important parts of your pitch and 2 – You’ve never fumbling for words! 4. Practice! Practice! Practice! Whether you record your sales conversations and critique them, role play with a coach or mentor, or practice in the mirror – the more you practice the better you will be! Not to mention, the more comfortable you are – the more confident you are! The more confident you are – the more you will hear YES!.